The Boys' Brigade is a worldwide uniformed organisation for Boys which aims to combine drill and a range of activities with Christian values. It was one of the world's first uniformed organisations founded by William Alexander Smith which in 2008 celebrated its 125th Anniversary. 1st Haslington is one of the thousands of Brigades around the world which offers activities such as Football and Cricket to Weekend Camps and Kayaking and many more. 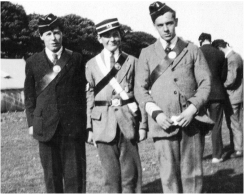 1st Haslington started in 1970 with the formation of the Company section, the Junior Section followed a year later in 1971. 1st Haslington was originally part of the Warrington Battalion, but when more Boys' Brigades started up in nearby areas the East Cheshire Battalion was set up. With 24 members in our Company, it grew to become a big success. The 1st Haslington Boys Brigade has had five captains - Ray Smith, Reg Shore, John Cain, Rob Welch and John Quigley (our current captain). In the 1970's, 1st Haslington had a brass band which was the BB National champions for two years. We also had a quiz team which reached the national finals twice and in the 1980's we were the North West District football champions. The core age range of the Anchor Section is from 5 to 8 years. This age group has its own programme called 'Anchors' based on five areas; body, mind, spirit, community and creativity. The emphasis is on fun and programme activities include games, crafts, stories and opportunities to learn and share in new experiences. Throughout their time in the Anchor Section, children can gain badges and recognition for their participation in the programme. Children in the Anchor Section wear a core uniform of a blue polo shirt and red sweatshirt. On some occasions members will wear school trousers and footwear as part of the uniform. The core age range of Junior Section is from 8 to 11 years, usually starting in the school year following their 8th birthday. This age group has its own programme called 'Juniors' based on five areas; body, mind, spirit, community and creativity. The programme provides challenges, adventure and opportunities to learn and grow. The fun and engaging programme enables the children to work in a team and take more responsibility. Juniors also get the opportunity to go on camps and residential trips, and for some this will be their first night away from home. Throughout their time in the Junior Section, children can gain badges and recognition for their participation in the programme. Children in the Junior Section wear a core uniform of a blue polo shirt and royal blue sweatshirt. On some occasions members will wear school trousers and footwear as part of the uniform. The core age range of Company Section is from 11 to 15 years. Young people in the Company Section wear a core uniform of a blue shirt & tie and navy blue sweatshirt. Also members wear school trousers and footwear as part of the uniform. The core age range of the Senior Section is from 15 to 18 years. Young people in this age group are encouraged to lead their own programme, supported by volunteer leaders. It’s all about the young people deciding what they would like to do and organising it for themselves. The 'Challenge Plus' programme for this age group is based on projects and challenges, encouraging young people to complete one-off challenges and more in-depth projects both of which can be tackled individually or as part of a team. Activities may include ‘Homelessness’, ‘Conservation’, ‘Driving’, ‘Preparing for Work’ amongst many more.There are opportunities to go away on camps and residentials, which are often the highlights in the annual programme. In addition there may be international opportunities open to the Seniors Section, ranging from attending BB events abroad to volunteering on community projects in developing countries. Young people in the Senior Section wear a core uniform of a blue shirt & tie and navy blue sweatshirt. Also members wear school trousers and footwear as part of the uniform.